Pick any TWO seats (in Light Blue) on the map. Checkout and save! Tip: Only buy seats marked "Instant e-Ticket" for fastest email or mobile delivery. Q: Can I purchase a ticket from a US Open subscriber? Yes, you can. The USTA has partnered with the US Open Ticket Exchange by Ticketmaster, to serve as the exclusive resale partner for the US Open. US Open subscribers as well as individual ticket holders have the opportunity to resell their unused tickets in a secured fan-to-fan environment, sanctioned by the USTA. Do you only need to buy One Single Ticket at the lowest price possible? 1) Use this 2-for-1 special code to buy 2 tickets. 2) If you cannot attend, simply sell the extra one ticket back later. Or bring a friend! Selling Tip: Set the price a bit less than the lowest price to get a buyer quickly. Money is deposited to you via debit card or US bank account! All weekend tickets (AM and PM sessions) will sell the quickest. By August most may already be gone! Check back on Mondays @ 9AM EST to see if additional tickets have been added for sale. 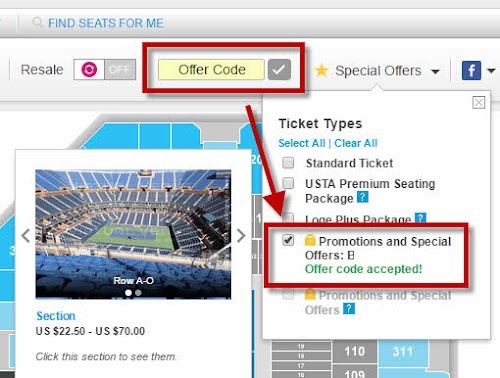 New US Open Offer Codes and Tips - subscribe to get see all our US Open deals!